This recipe is a gesture in the direction of Julia Child’s Shrimp in Lemon and Garlic – I used her minced zest strategy. My husband walked in while I was mincing – the tip of my chef’s knife weighted by my right palm, as the left (I’m a lefty) handle-end doing the work of miniaturizing. He was like, you know we have a zester… I was like, Hello Sweetie (insert image of River Song greeting bowtie Dr. Who) and then said, not today, I’m channelling a chef who says so. So mince I must. Ever the Mediterranean, I added more garlic than recommended. And more dill! But I left out salt, I don’t know why. My husband and I ate it for dinner. He on a flat plate with no juices (he doesn’t like left over juices). Mine in a bowl fill to the brim with liquids. He’d then wait patiently for me to toss my discarded tail into a side dish, before dunking his shrimp into my bowl for more of the delicious lemon, garlic sauce. This would be great over a pasta or sopped up with a big old crusty bread. Pour the olive oil in a large skillet on medium-high heat, and add the pressed garlic. Allow about 1 minute for garlic to saute, and add the zest. Leave this for another 30 seconds to infuse the oil with zest. Add the shrimp and the dill, stirring occasionally. They cook quickly, about two minutes. 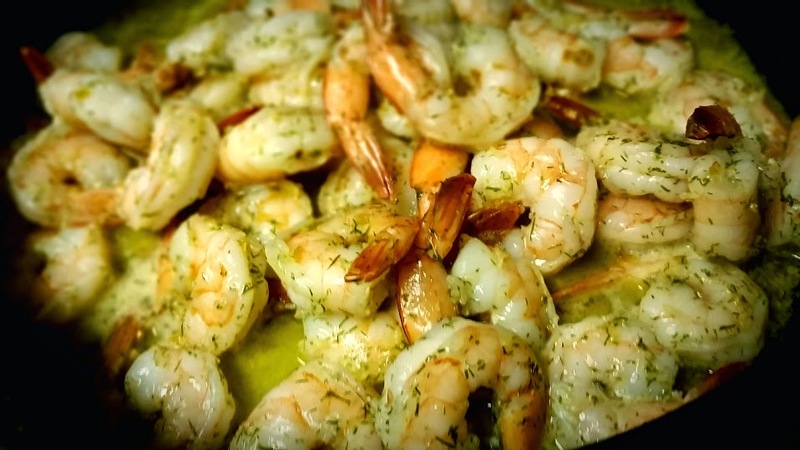 As Julia says, “When the shrimp have curled… and feel springy” remove from heat. Add the lemon juice, stir, and serve.